Once our kitchen cabinets were installed, we realized that we needed to order countertops, like, immediately. Before getting too far into planning our kitchen remodel, we decided to go with quartz countertops. I didn’t like the look of granite, because the pattern throughout the slab wasn’t very uniform. Many houses we saw when we were home shopping had semi-updated kitchens, which almost always had granite countertops. I dubbed one house the “paprika house” because the counters looked like they had been permanently stained with paprika, due to the granite slab that was chosen. Plus, granite needed to be sealed every year or so, and I knew that wouldn’t be high on my priority list. And lastly, granite stained and chipped rather easily. We’re big cooks, and use the kitchen just about everyday. I needed a countertop that could withstand heavy use. Quartz appealed to us immediately. It never had to be sealed, it could withstand high temperatures (for the pan that comes out of the oven and set directly on the countertop without a trivet), and it looked very uniform all over the countertop. But, quartz is more expensive than granite. Of course. We reviewed our options of where to buy. Again, we headed to Rock Counter to see about ordering our countertops there. The selection for quartz was somewhat limited. Still, we found a color we liked and got a quote. Here, there were more quartz options, but it was so expensive. Because of our long countertop length, we would require two quartz slabs. For the bigger shops, selling smaller slabs of quartz wasn’t a big deal. But at a store that doesn’t sell much quartz, we would be required to purchase the entire two slabs, not just a portion of the second one. That made the pricing too high for us. Also, we would have to find our own contractor to install the countertop. That didn’t appeal to me at all, as I was set on finding a seller who also installed. My biggest concern would be if the quartz breaks in transit or during installation. If you have different parties doing the work, what happens if something goes wrong? If you buy from a one stop shop, there would be no question that if the quartz broke, the company would have to replace it. So, even if the pricing was comparable, I wouldn’t have gone with a seller who couldn’t install. The selection was great, the price was the cheapest, and we would only be required to buy the actual square footage we needed. We quickly put in our order for Caeserstone quartz in the Concrete color. The salesman was going to come by in a couple days to measure, and then he would put in our order. The next day, he called us and told us they were out of the color we had chosen. OK, well, how long until it’s back in stock? Over 3 months! Every store in America was out of this particular quartz, and it wasn’t being shipped back into the country for at least 3 months. Waiting another 3 months without a functional kitchen was not an option. We decided to head back in to the store to pick a new color. We ended up with Silestone’s Cemento, which was very similar, just a little bit lighter in color. And it could be installed within a week or so! Luckily, my dad agreed to head over to our house on installation day, as we were on vacation at the time. 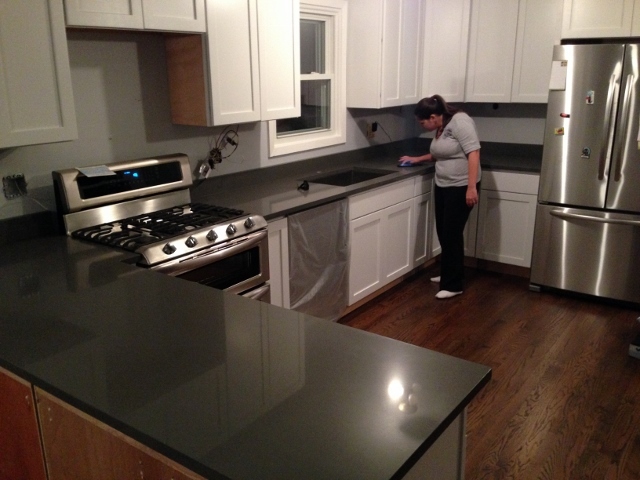 When we did get back home late from our trip, our countertops were in! There stood our kitchen in all its glory. Just ignore me lovingly stroking the countertop. At this point, the kitchen still isn’t finished, and we’re now 3 months into the renovation. We still have to add backsplash, install/move the overhead lighting, install under cabinet lighting, finish the built in seating area, add floor trim, add trim to the cabinets, install cabinet hardware, and the list goes on. But for now, I could cook and wash dishes in the kitchen. For that, I was grateful. « The Cabinets Are In!! !